Novice actor and video-rental entrepreneur Robert Koonce-Bey and artist Ilene Berman talk about the Shake38 play "A Day of Confusion." One of these presentations brings three friends together in a place where you can buy everything from fried chicken to cell phones to hair extensions: Grand Market and Cellular on North Grand Boulevard just north of Grand Center. Playwright and performance artist Sahara Scott cast in her play several people who work at the market or just hang out there. “This is the first time we’ve partnered people who may not have acted before and then actors,” Scott said. You can also rent movies at Grand Market and Cellular. That’s where Scott found Robert Koonce-Bey and Steve Hamm-Bey, who lease a small corner of the space. 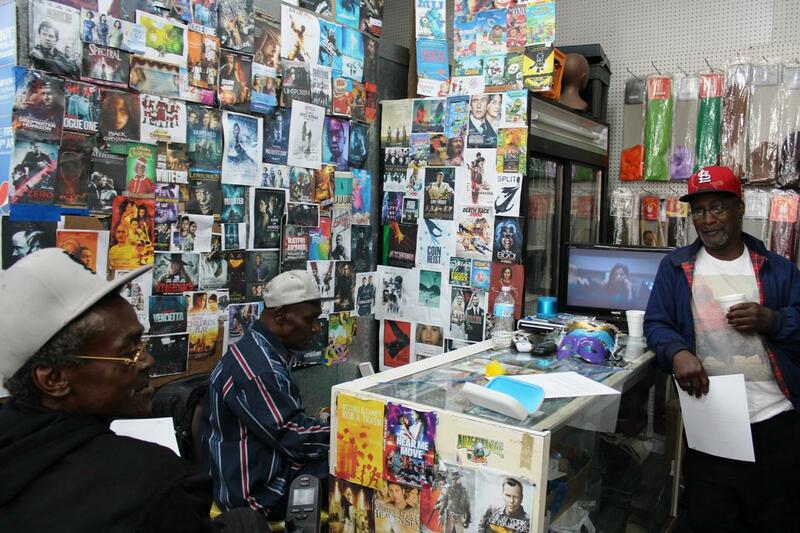 They do business against a busy backdrop of dozens of DVD covers ranging from “Moonlight” to the latest “Madea” film. Novice actors, left to right, Steve Hamm-Bey, Robert Koonce-Bey and Walter Martin-El go over their scenes for the play "A Day of Confusion." Scott plays the narrator in “A Day of Confusion." Koonce-Bey and Hamm-Bey are also in the cast. Like the Bard’s original, this modern-day version follows two sets of twins, separated at birth. Mayhem ensues when the missing twins begin showing up in their brothers’ lives. Hamm-Bey, who plays one twin, chose a minimal role. Hamm-Bey joined the cast because he was curious about acting. He’s admired Shakespeare since he read “Othello” in grade school. When he saw the script for this new take on “The Comedy of Errors,” he identified with the characters’ bewilderment. Koonce-Bey is in the play to return a favor. Every Wednesday, artist Ilene Berman loads up her bike with art supplies and rides it to Grand Market and Cellular, in an effort called “Room 13 Delmar.” The market’s Shake38 play is part of Room 13. Berman began her mobile art studio to expand the arts beyond Grand Center, loosely defined by the area around Grand Boulevard between Delmar and Lindell boulevards. “There’s no investment in the arts north of Delmar,” Berman said. Once a week, Berman supplies regulars and passersby with paint, paper and sculpture materials. She said both the art-making and the play promote themselves. 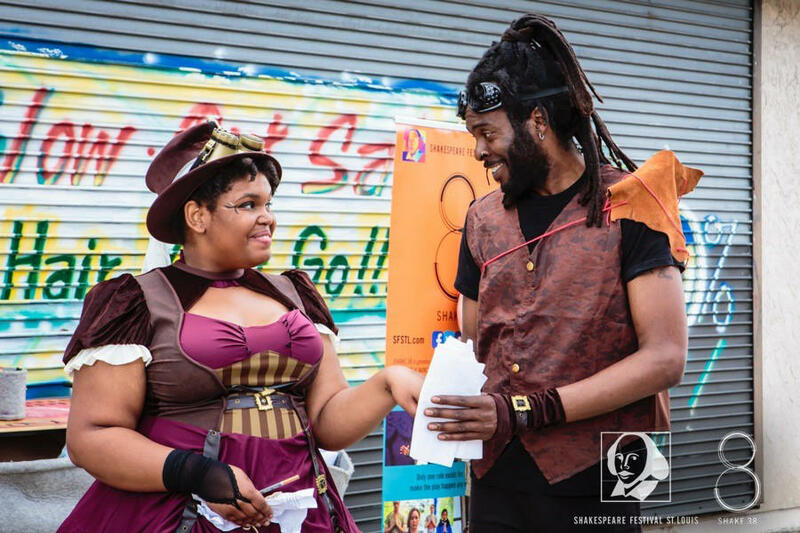 Sahara Scott and Lawn Gabriel perform in last year's Grand Market and Cellular Shake38 presentation based on All's Well That Ends Well. Koonce-Bey is grateful for the weekly opportunity to paint and sculpt, and for Berman’s mission. “My friend is looking out for the people around here,” Koonce-Bey said. Another novice actor in “A Day of Confusion,” Walter Martin-El, is a friend of Koonce-Bey and Hamm-Bey. He’s confident in his new role. “I guess people just like my swag. I’m just a fun-loving guy,” Martin-El said. The full schedule of Shake38 plays includes presentations at Midtown's Urban Chestnut Brewing Co., Left Bank Books and Lafayette High School. A new addition this year pairs Shakespeare with the works of St. Louis chefs in a project called “38 Eats.” They’re whipping up special Bard-inspired dishes to serve during the five-day event in restaurants ranging from The Libertine to Crown Candy Kitchen to Cardwells on the Plaza. “It’s an incredible opportunity for the community, represented by amateurs and professionals alike, to come together to showcase Shakespeare’s plays through their own creative interpretations,” said Rick Dildine, Shakespeare Festival’s artistic and executive director.